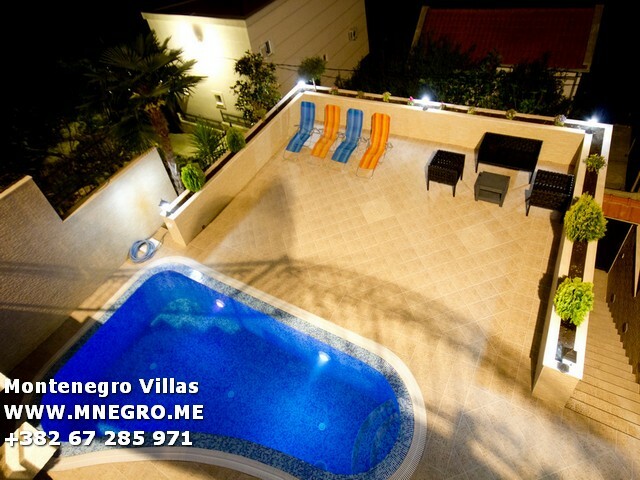 ME323 MONTENEGRO villa with pool RENTAL | MONTENEGRO Villas 2019 rental UNIQUE Vacation for You !!! ME323 MONTENEGRO villa with pool RENTAL – MONTENEGRO Villas 2019 rental UNIQUE Vacation for You !!! House has high class security cameras and alarm ,internet,inter-phone and satellite with worldwide channels. On the ground level house has two big car garage and extra storage room. On the ground level is a nice made gate with stairs that bring you to the second level where is a huge terrace of 113 m2 with circle swimming pool. On second level is a first floor that contains ; 1 living room,1 bedroom ,1 bathroom,1 kitchen with mini terrace . Outside stairs for third floor which contains 3 bedrooms in the roof , mini bathroom ,mini kitchen and big terrace in wood stile. House is new contraction and has all furniture .